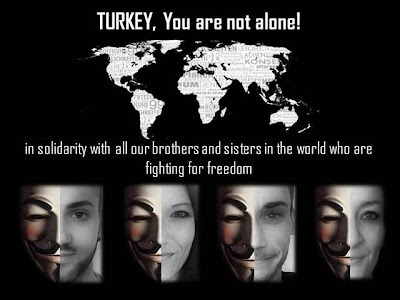 Internet Activists and Collective Hacker group Anonymous carried out a series of cyber attacks on Turkish government websites in retaliation for violent police response to anti-government protests, launched #OpTurkey operation. There are several videos to be seen on YouTube about the protest of yesterday, one of the videos show one of the protesters wearing an Anonymous mask. “You have censored social media and other communications of your people in order to suppress the knowledge of your crimes against them. Now Anonymous will shut you down and your own people will remove you from power,” the group tells the Turkish administration. The Anonymous attack came after a series of brutal clashes between police and protesters that arose on Friday after Turkish police conducted a crackdown on a peaceful environmental demonstration in Istanbul’s Taksim Square. Hackers normally use distributed denial of service (DDoS) attacks to knock their targets offline. Anonymous has already managed to take down a number of media sites that support Erdogan government, including that of the private news broadcaster NTV, which has been heavily criticized for ignoring events of the last few days. Other sites believed to have been attacked include Turkish President Abdullah Gul’s personal website, the Istanbul Police Department’s website, and that of the ruling Justice and Development Party (AKP). 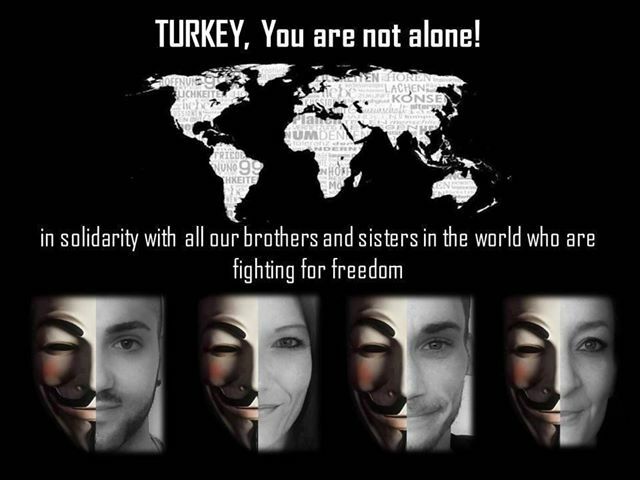 “We have watched for days with horror as our brothers and sisters in Turkey who are peacefully rising up against their tyrannical government [have been] brutalized, beaten, run over by riot vehicles, shot with water cannons and gassed in the streets,” Hackers said in video.